Bob Paisley - LFChistory - Stats galore for Liverpool FC! The Times report on Liverpool - Manchester City on 09.04.1977. Bob Paisley had the best insight in football. Here is his view on Bruce Grobbelaar. 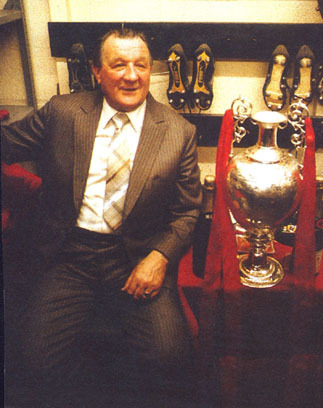 Bob Paisley admired Gerry Byrne's courage in the FA Cup final when Liverpool triumphed over Leeds. Sammy Lee could run and run. He was small in stature but had the heart of a lion! The story of how Liverpool's greatest legend joined the Reds. Bob Paisley's opinion on Alec Lindsay. How do you take over from a living legend?, is the first question Bob Paisley poses in his profile of the Liverpool great, Peter Thompson. Frank Keating reports on Bob Paisley's funeral. From The Guardian on 22.02.1996. Daily Mail report on Chelsea – Liverpool 4-2 on 9 January 1978. From Liverpool Daily Post on 20th July 1974. "Alan Hansen is the defender with the pedigree of an international striker. He is quite simply the most skilful centre-half I have ever seen in the British game. He is a joy to watch. Alan has always been an excellent footballer, a beautifully balanced player who carries the ball with control and grace. He has a very measured, long stride and is much faster than he looks. I can't think more than a couple of players who could beat him over 100 metres. He has both the ability and the patience to launch attacks from deep positions." "With the character and attitude he shows they’d make him Mayor of Liverpool if he was a few inches taller." "The injury he suffered at Goodison Park at the start of the year was as ill timed, as it was painful. It was painful to look at, never mind to experience. I've seen one or two broken legs in going on fifty years in the game, but not one made me really wince, Jim's did. Jim had a 30 game run in the first team behind him." "It was definitely a crisis time when Bill left. It was a bombshell and Bob was very reluctant to take the position as manager. When we approached him he said no. In the end the chairman, directors and I had gang up on him." "I asked Phil Neal and Ray Clemence if they got telegrams from the boss when they were on international duty. Phil said they did, with the message ‘Good luck’. I told them the boss sent them to me when I was away with Wales. The message he put on was, ‘Keep out of trouble’." "I think when he first succeeded Shanks, he was a bit overawed. I'll never forget him standing in the dressing room in the summer of 1974 on the first day of pre-season training and telling us: 'Shanks has gone and they're giving me the job even though I didn't really want it. But we must try to carry on what he's started' He saw it as his duty to take the job. Yet he set an incredible record that will never be beaten. Things just snowballed for him after that first season. For me, he was a better coach than motivator of men, but a shrewd judge of a player and very strong tactically." "Bob was so down to earth. A common phrase of his was: 'If the floor needs sweeping, I'll pick up a brush and do it'." "As a former headmaster, I thought I was pretty hot at weighing up people and situations. But you have to be quick and alert to keep up with this fellow! I've watched many matches not involving Liverpool with him and very little escapes him. When a goal is scored, he'll have the complete move analysed in a flash and he'll often emphasise the contribution of players running off the ball who were not directly involved. You might not even have been fully aware of them yourself. Every scrap of information was stored in his memory. He astounded me by recalling detailed incidents of matches we saw a long time ago. He wasn't given to chatting for long periods on the journey home. That was probably when he was concentrating and reflecting on what he'd seen at the game, which he'd instantly be able to recall." "He bought players and moulded them together to create great teams. People talked about him as 'Uncle Bob', but he was as ruthless as they come. Anyone who worked under him, as I did, knows that. He could be hard but he went about it in the right way and was quite gentlemanly about it, for all his rough edges. He had a genius for creating teams." "Although Bob Paisley always seemed to be super cool, deep down it wasn't always so. He was the kind of his person who hung his emotions on his sleeve. And you could best spot this in the dressing room before kick off. By 2.45, you could tell what he was going through by just looking at his face. He would be pacing up and down the dressing room taking sips of water. He looked more nervous than the players, although he did his best to try and not show it. I don't think everybody realised that but I could see it." "Bob's knowledge of players and the game in general is unsurpassed. Football has known no equal in management or prize-winning, but his modesty and dignity were overwhelming as he led this club from one triumph to another. His name will always be synonymous with Liverpool." "In my first year as manager, I made a habit of counting to ten before I made a decision. I was cautious, deliberately. I took my bends wide instead of hugging the rails, probably because I was keen not to trip up. Now I'm learning, now I count only to two before I make a decision."